With wedding season coming to an end, I've been trying to take advantage of the sunshine and clear skies this autumn. I honed in on Stanley Park as my location of choice to capture sunrise photos as I was inspired by many beautiful pictures from Instagram (@noyocreative). Stanley Park is a massive public park that borders the downtown of Vancouver, B.C., Canada and is nearly surrounded by the Pacific Ocean. These images were captured from the seawall. 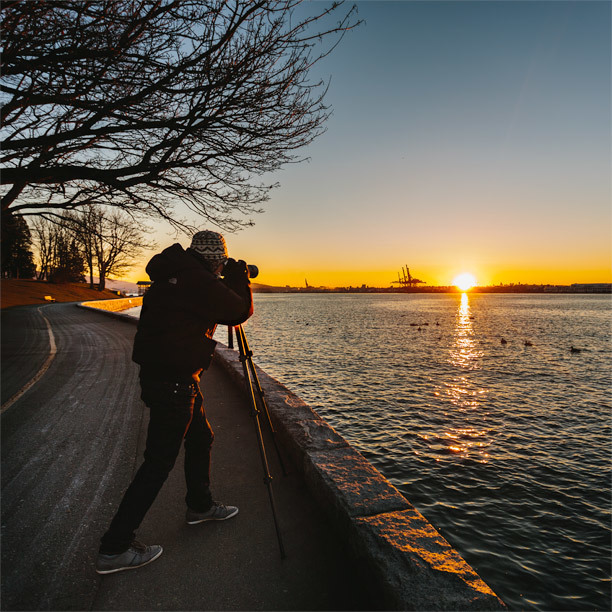 Brian Lee capturing the sunrise along the seawall of Stanley Park, Vancouver, B.C., Canada. Vancouver city skyline from the seawall of Stanley Park.